CALGARY, Alta., Canada, March 16, 2019 – The U.S. Team brought home eight event medals at the University of Calgary International Cup in Calgary, Alberta, Canada. All four U.S. gymnasts won medals in the event finals. Here’s the U.S. medals breakdown from the event finals. Sean Melton, Orlando, Fla./Ohio State University: floor exercise and horizontal bar gold medals; parallel bars silver; and still rings bronze. Genki Suzuki, North Wales, Pa./University of Oklahoma: horizontal bar silver; and floor bronze. Robert Neff, Brookfield, Wis./Stanford University: parallel bars bronze. In the floor exercise, the USA had the top three scores. Melton and Loos both posted a 14.200, the top two scores. Suzuki was third at 13.566. Melton claimed the still rings bronze with his 14.166. Canada’s Ryan Oehrlein had the top score of 14.300, with his teammate Chris Kaji second at 14.266. On the horizontal bar, Melton and Suzuki went one-two. Melton tallied a 14.033, with Suzuki not far behind at 13.933. Canada’s Jackson Payne was third at 13.566. Melton nabbed the parallel bars silver, where he posted a 14.333 and finished just ahead of Neff’s 14.300. Payne took the gold at 14.666. For pommel horse, Suzuki, Neff and Melton finished fifth (12.400), sixth (12.133) and seventh (12.033). Canada’s Thierry Pellerin won the event at 14.500. 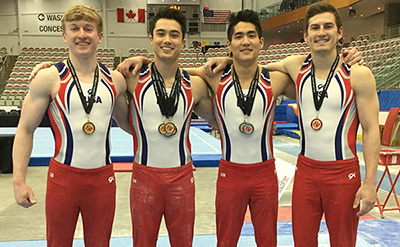 On Friday evening, the USA won the team title, and Melton earned the all-around gold.